Bobcats are a mid-sized wild cat named for their bobbed tails. They have pointed ears and are about double the size of a domesticated housecat. 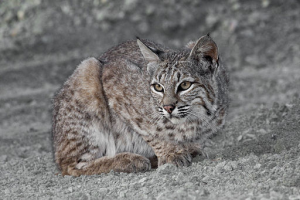 Bobcats live all over North America and are rarely seen by humans because of their nocturnal and elusive nature. They live in a variety of environments including swamps, deserts, and even developed areas. "Bobcat (Lynx rufus), resting, Montana de Oro State Park, San Luis Obispo Co., California, May 2011" by Marlin Harms is licensed under CC BY. 2014 "Bobcat." National Geographic. http://animals.nationalgeographic.com/animals/mammals/bobcat/, accessed July 8, 2014.